The northern lights have been amazing this year so far. 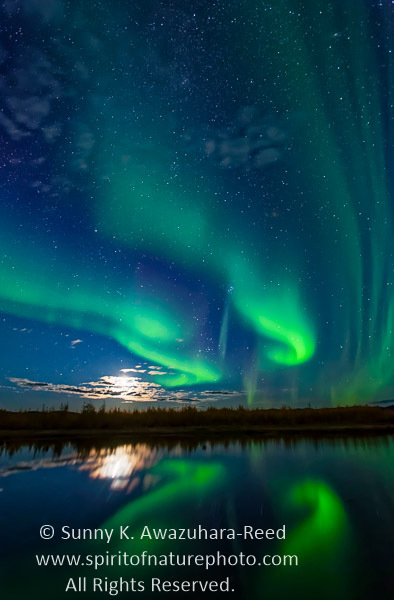 The strong aurora has been appearing in the northern sky since the middle of the August. 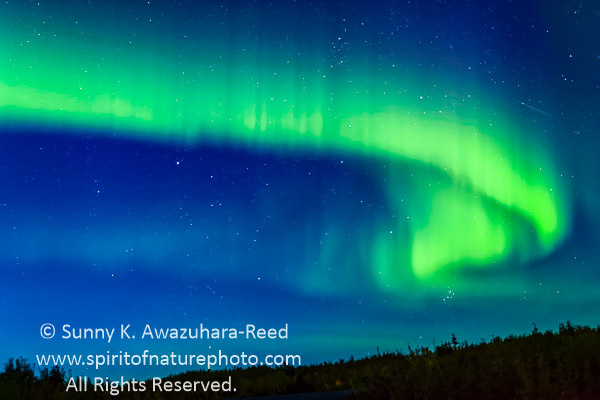 I headed north from Anchorage to capture the great northern lights and spent the first night near Fairbanks where the northern lights were outstanding and lasted for hours. The next day, I camped in a mountain pass north of Tok, in eastern Alaska near the Canadian border. The sky was clear all day. The aurora was already visible while the sun was still setting. 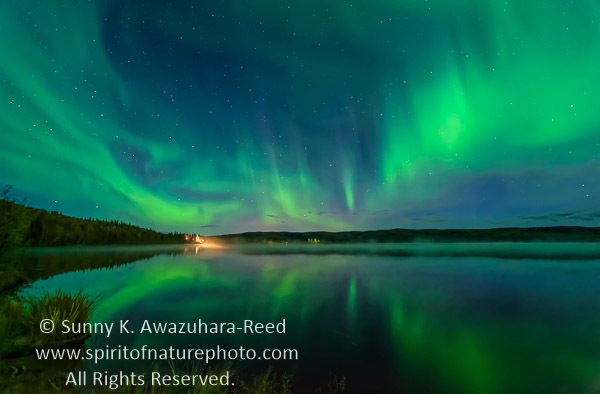 As the sky darkened (sunset takes a long time in northern latitudes), the northern lights became brighter and more intense. The curtain-like lights waved in the northern sky and stretched across the horizon. Then it turned into fish shaped lights! I like to call this "Spirit of Salmon." The Aurora that night was very active. It was almost nonstop movement with constant waving, dancing, circling, swirling, and spreading. Bright intense lights continuously moving. 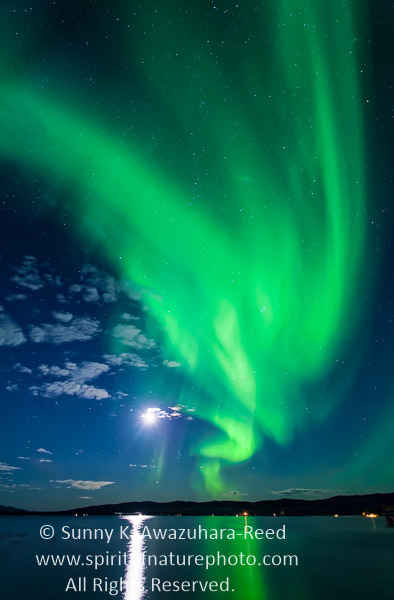 The northern lights show was all over the sky, a 360 degree view for the whole night! It was also fall color season... 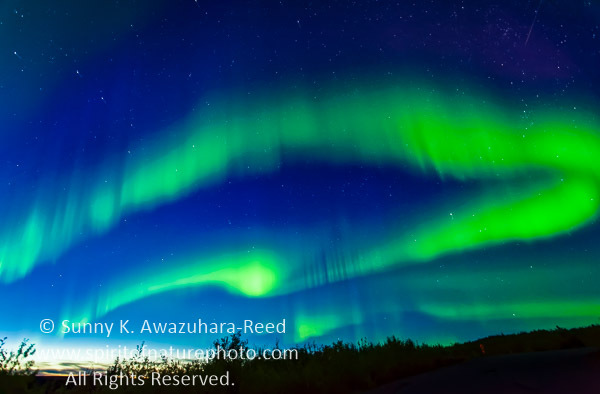 The vivid and most beautiful time in Alaska. 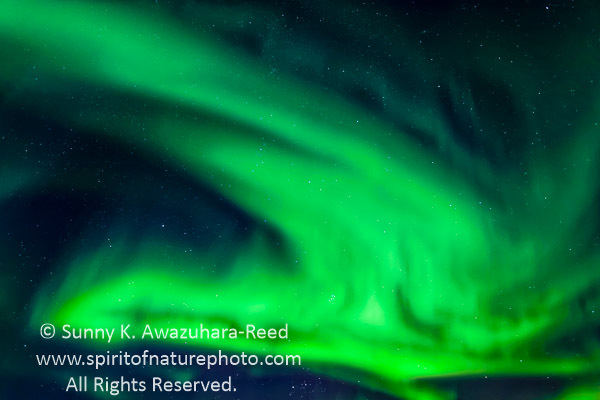 It is also nice to see the northern lights in warmer temperatures instead of 20 below. I'll post some fall color images on my next posting, please visit back soon. The northern lights started early this year! 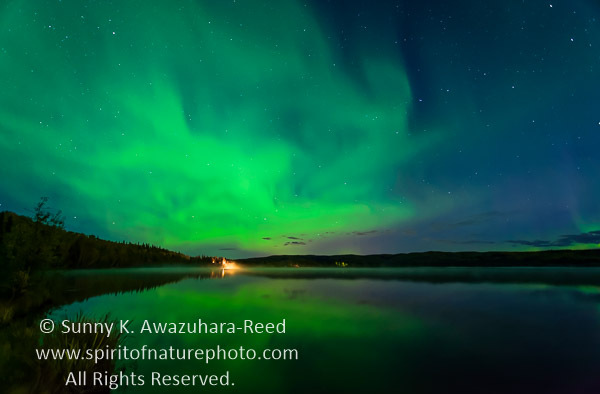 As soon as the darkness of night returned around the middle of August, the Aurora started dancing. 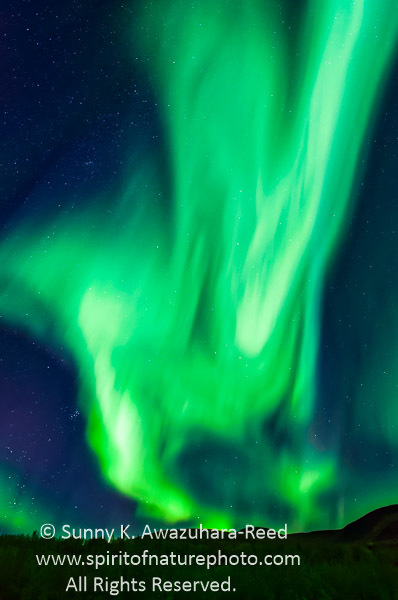 This year seems to be the great year for the northern lights. There have already been several days that the aurora activity has been strong enough to be visible from just north of Anchorage. 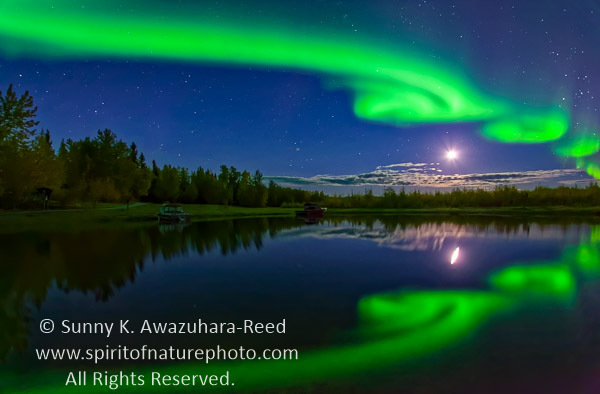 When solar activity is high, the bright aurora dances across the sky in the Arctic region. 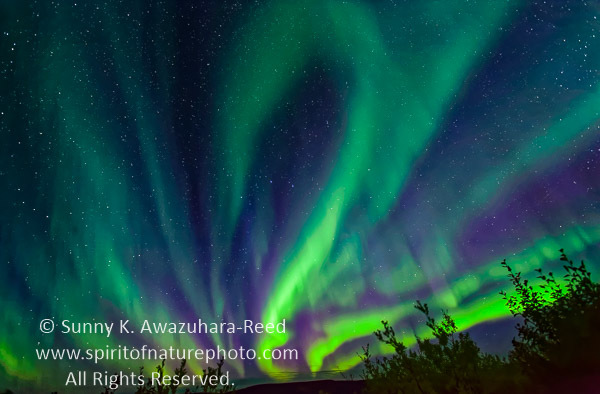 Although the lights can appear near Anchorage, they are much brighter and move vibrant in more northern latitudes. 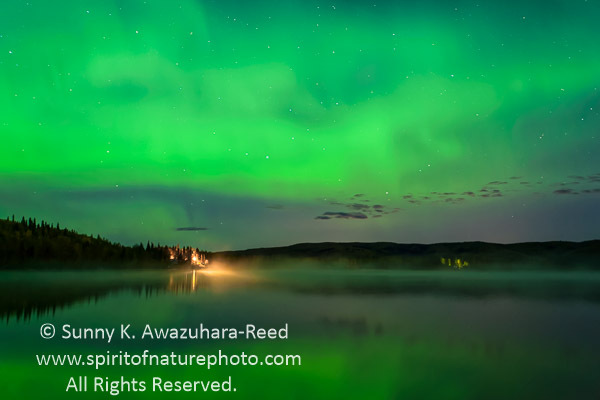 In early September, I packed up the camera gear and headed north towards Fairbanks. The sky was clearing as I got closer to Fairbanks. Around midnight, the aurora began appearing... It started as a faint straight light across the sky. Then, the lights started moving by the time I arrived at one of the local lakes. The bright moon rose, but the aurora was still bright under the moonlight. The weather was calm, no wind. The arch of lights were waving above the small lake. 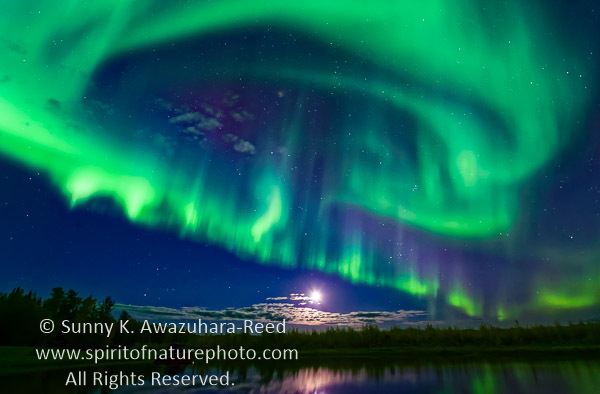 The aurora continuously danced all over the sky. The ribbon like lights moved across the sky and disappeared, then the next ones formed above the horizon. The intense fire of lights flaming above the lake... The fire created an arrow-like light and ran across the sky! The northern lights continued on and on for hours... 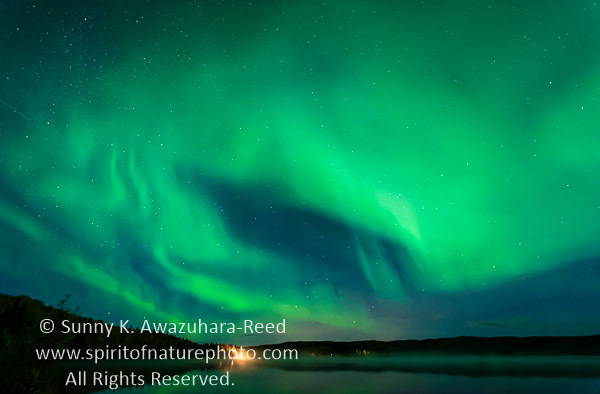 Arriving at another lake, the lights were dancing all over the sky and swirling! The lake was a perfect mirror for the light show. 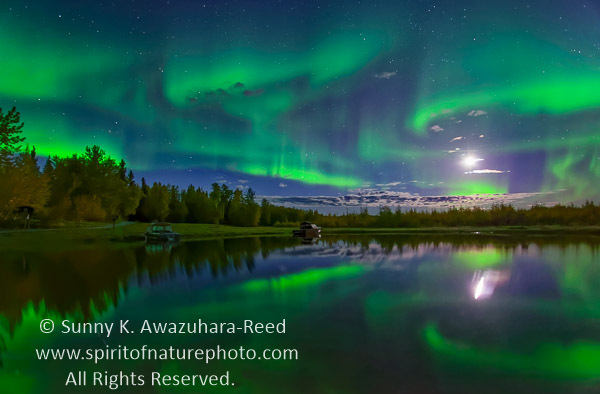 Being able to photograph the northern lights' reflections occur only at this time of the year before the lakes freeze. 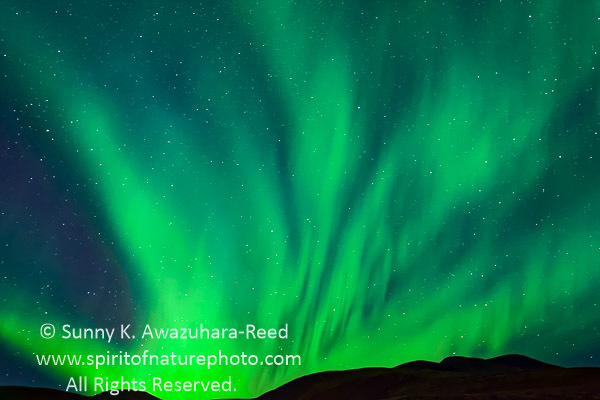 At one point, the neon green colors spread from the horizon to zenith! It was one of the best aurora I have ever seen! 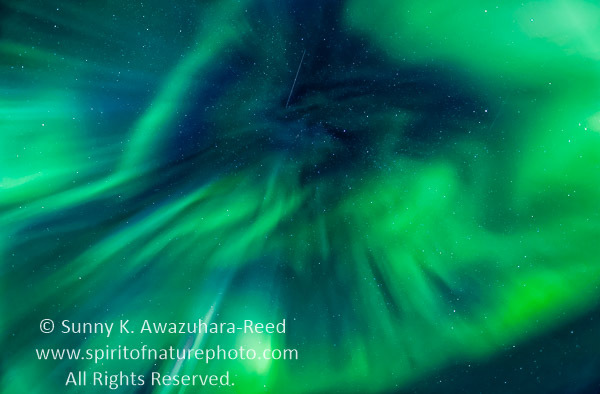 I camped near Tok, in eastern Alaska the next day... Another great night for aurora! 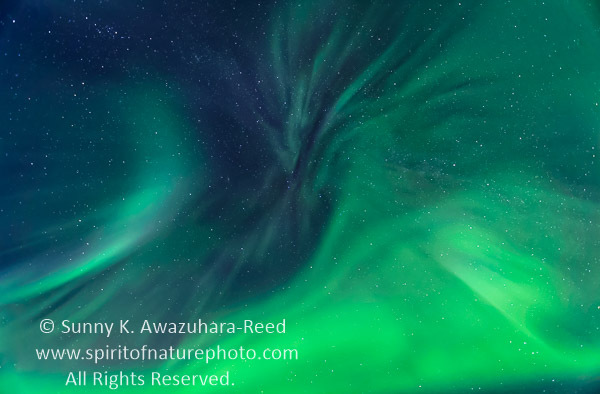 To be continued in the next posting, please come back to see more aurora images! 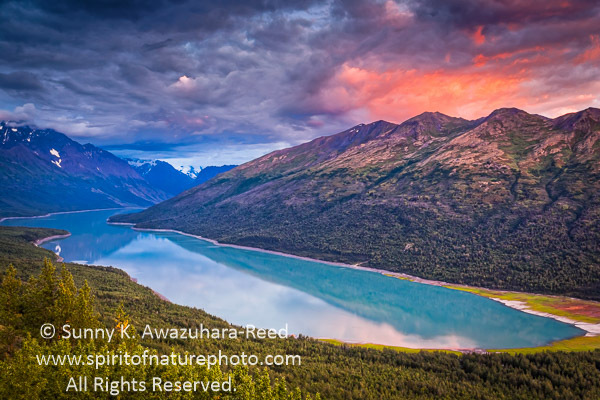 Eklutna Lake is one of many amazing scenic places near Anchorage. When the sun shines, the deep turquoise color of the lake shows vividly. I have been photographing the lake from various vantage points in recent years. One of those beautiful evenings, I was hiked up the trail overlooking the lake to capture the sunset. 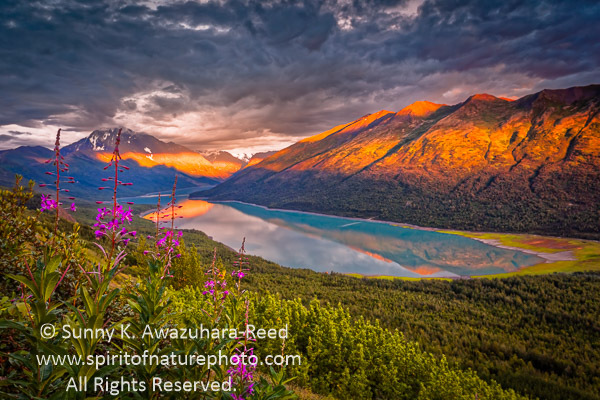 It was early July, sunset in southcentral Alaska occurs around midnight! The sun was already low as I hiked through the wooded trail when suddenly I heard a loud noise in the brush near the trail. A black bear was walking in the woods not so far from where I was! I made it to a nice open area overlooking the entire Eklutna Lake. The sun was already very low and dim light began painting the clouds in reddish gold. 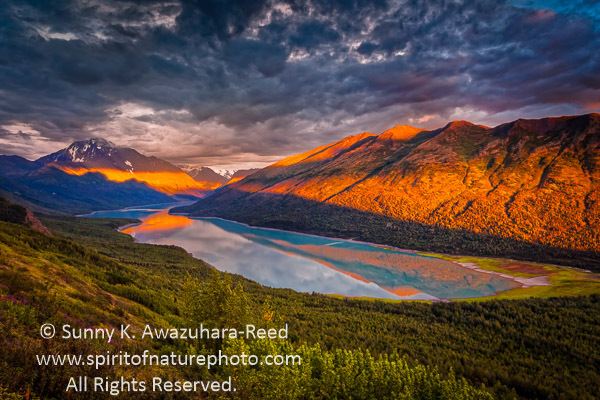 The warm lights broke through the clouds and created a ribbon of lights on the mountain range above the lake! I love this kind of lighting often seen in Alaska. 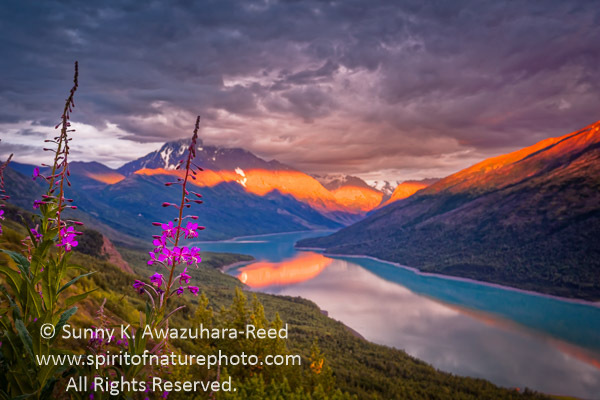 The Fireweed's deep pink flowers were already blooming in the area and it was only early July! There is an old saying in Alaska; when the fireweed flowers bloom, summer is ending... only bottom part was blooming but thinking the end of summer was coming made me sad. Sunset normally takes longer in northern latitudes, but it was quicker that evening... Gold colors in the clouds faded quickly. I had only enough time to capture it from just a few different spots.